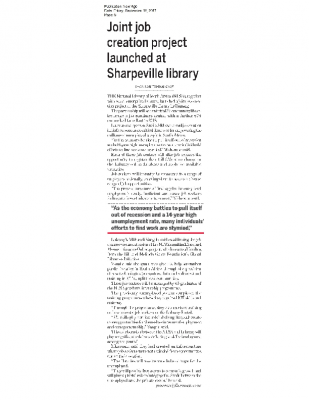 Lulaway and the National Library of South Africa launched their job creation partnership 12 September 2017 at the Sharpeville Library in Gauteng. 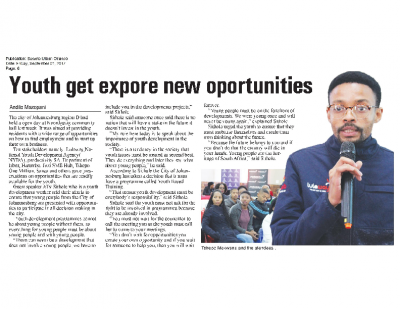 The partnership between the social enterprise Lulaway and the NLSA will see 27 community libraries house Job Readiness Centres, with a further 300 earmarked for rollout in 2018. Each of these job centers will offer job seekers the opportunity to register their full CVs, for no charge, on the Lulaway online database and apply for available vacancies. These job seekers will be instantly connected to a range of employers nationally and be able to access a diverse range of job opportunities. The establishment of these job centres is an extension of NLSA’s multi-million rand Mzansi-Libraries Online project which has received funding from the Global Libraries Initiative of the Bill and Melinda Gates Foundation. 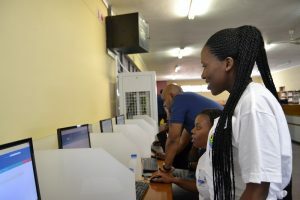 The grant was given for strengthening public libraries in South Africa through provision of new technologies (computers, data, software) and training in ICT to uplift local communities. Hundreds of national libraries have been equipped with the latest technology and data connections for all library users to access. As a further to the communities, the NLSA has appointed Lulaway to further utilize the library space and access to technology by establishing Lulaway job centres at 27 of these libraries. These job centers will be managed by the 65 graduates of the NLSA BCX Graduate Internship Programme. The previously unemployed youth completed the training programme where they acquired ICT skills and training. Through the Internship Programme they also received training on the Lulaway Portal in order to assist job seekers. ICT skills play a crucial role in helping the youth create more opportunities for themselves in terms of employment and entrepreneurship. This collaboration between the NLSA and Lulaway will play a significant role in contributing to skills development amongst the youth. This initiative will provide unemployment youth with access to technology and information in order to take advantage of employment opportunities as well as align libraries as informa¬tion hubs contributing to the developmental needs of the communities. Rockefeller Foundation Representative (SDO) South Africa for Impact Sourcing & Digital Jobs Africa. 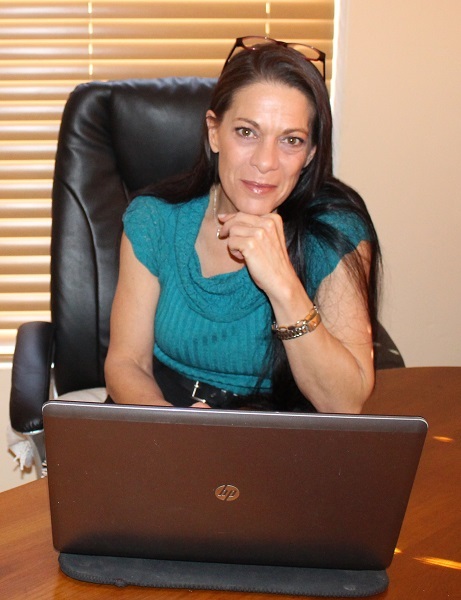 Traci Freeman is deeply passionate about doing her part to create a fair and flourishing world. She shared fascinating insights about developments in the world of social impact, the interconnectedness between corporate and non-profit, and the promising state of South African youth. 1. What are the positive developments in social impact that you have observed? The main change that I have observed is an increased collaboration between corporates and non-profit/aid organisations. On a local (South African) level CSI spending is required expenditure. While companies were dutifully spending this money, it was mostly out of obligation without considerable focus as to where it was going and the impact it was having. I am now seeing that companies are becoming more deliberate about where this spend is going, as opposed to it simply being a ‘tick-box’ line item. Businesses are becoming increasingly committed to intentional impact. They realise that it is not just about giving the money; but it is about investing, upskilling and doing pro-bono work with non-profits to directly benefit communities. I think we are seeing this shift because the business world is gaining in its understanding that we are all inter-connected and intricately linked. They are becoming conscious that they are no longer separate from the social problems of the environment in which they operate. It reminds me of the quote by a previous Director General of the International Labour Office, Juan Somavia, ‘Poverty anywhere is a threat to prosperity everywhere’. For example, environmental crises like floods and droughts – which we are currently seeing a lot of – negatively affect organisations in their ability to do business and produce value for their shareholders. Similarly, social problems – like labour strikes and service delivery protests – decrease their ability to operate and generate revenue. Because of this, corporates are now using their CSI spend for intentional impact. They realise that they need to be an active part of the solution. By being intentional about where their contributions are directed and intentionally investing in interventions with maximum tangible impact, everybody benefits – the local communities, the corporates and the shareholders. 2. How do we need to start thinking differently about aid to drive far-reaching change? Dan Pallotta, an American author and humanitarian activist who redefines how we should be thinking about aid, has re-shaped my thinking around the non-profit sector. According to Pallotta, traditional thinking around non-profit organisations is limiting unlocking the true potential of the non-profit world. Do-good organisations are mostly evaluated according to the same principles as a for-profit business. They need to show their worth, and the bottom line is how much ‘value’/ income is generated in a given period according to typical financial accounting measurements. A crucial thing that needs to change is the willingness of funders to take risk. We need to let interventions operate for a sufficient time-period for learning to take place. Social impact is a long-tailed view. I believe that they are required to ‘show profit’ (or value) too early sometimes – and a ‘learning’ isn’t always seen as value. It is the necessity to allow and encourage non-profits to take risks and allow for sufficient time and investment for learning and long-term impact. Learnings are not always going to be positive; funders need to celebrate failure in the knowledge that this is how ‘not’ to repeat the intervention and try a new route. Again, the concept is ‘intentionality’. Intentional risk & intentional learning should not be seen as negatives. Systemic change takes time, and social issues are complex and nuanced. The triple bottom line is a powerful driver of creating a corporate world with an embedded socially responsible awareness. While CSI once was a ‘nice to have’ it now is part of your balance statement. The traditional CSI model demands organisations to account for every penny. The less you spend on marketing the better, and you can’t make profit. However, this is wrong. CSI should be judged on their impact; not on how little money they make and how little they spend on their ‘overheads’ like marketing. The goal is impact and measuring impact – and if more money spent on overheads and necessary resources such as top quality skill to drive the social impact business forward, the more impact can be achieved. Similarly, for the most part, people do not like the idea of their money being spent on advertising / promotions / awareness raising. Society seems to hold the above perceptions, and it is typified in asking “How much of a donation goes to overheads compared to ‘the cause’?” This question has some problems in it: It implies ‘the cause’ is not helped by overheads. This is not the case, especially if the overheads are spent on ‘growth’ and doubling / tripling the investment which in turn goes towards ‘the cause’. It prevents charities from growing or investing in fundraising. However, if fundraising actually raises funds, then it should be encouraged, giving them more money to push towards the cause. The focus should not be on overheads, but on the scale of the operation. We need to rethink how non-profits should work, and focus on whether they are achieving their goals rather than their investment to get there – in addition, social impact organisations need to re-think how they ‘think’ and operate and not see themselves as a side-line, poverty-thinking entity, but rather a fundamental necessity filling in gaps with ‘for profit’ agility and intention. 3. Apart from increased intentionality of where CSI funding is directed, what are the other roles of the corporates in generating impact? Traditional macroeconomics state that business will lift the economy by generating more revenue and thereby injecting more money into the economic cycle. While this is true, the role of business in driving social change does not have to and should not end there. As previously mentioned we are seeing increased intentionality around social spend which will uplift the very people and communities we source skills from and in addition aim to turn into customers. Above this, business is learning that socially responsible and inclusive business practices are worthwhile on a direct financial level. By adopting intentional socially responsible business practices within their operations, their bottom line can increase. Non-profits need to start thinking and acting differently by demonstrating that there is a compelling business case for socially responsible business practices. There are a few examples of non-profit organisations who have successfully created a for-profit mentality within the social responsibility space and we are seeing corporates and government as well as funders responding positively towards these organisations. Impact Sourcing, which is intentional hiring of individuals from marginalised communities, is an excellent example of how this works. 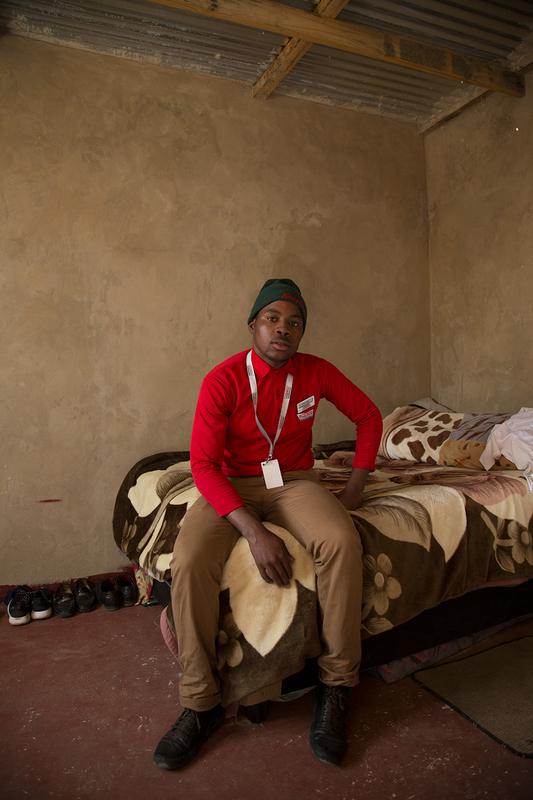 “Impact Sourcing” is an inclusive employment practice through which companies intentionally connect high-potential, marginalised youth to available jobs. The Rockefeller Foundation, through its Digital Jobs Africa initiative, has empirically demonstrated that Impact Sourcing has commercial benefit. 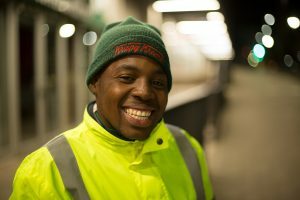 The rate of growth of unemployed youth is a challenged across the African continent, but it is a challenge which offers an opportunity for demand side / employers when they start thinking and acting differently and embracing alternate skills pools that can ultimately be harnessed as an opportunity for business innovation and social good. 4. Digital Jobs Africa is approaching the end of project lifespan. What are the Foundation’s Goals for the next 5 years with regard to employment in Africa? DJA was conceptualised in 2008 and officially launched in 2013 with a view to catalyse new, sustainable employment opportunities and skills training for Africa youth; with a focus on digital skills. Our goal is to influence a systemic change in business practice by demonstrating the value of Impact Sourcing and Demand Driven Training in South Africa and beyond, including placing youth in jobs across a variety of industries where digital skills are required, and ultimately, improve the social and economic well-being of entire families, communities, and nations. Our partners provide skills training to high-potential, marginalised youth in Africa. They educate companies about the benefits of practicing inclusive hiring through Impact Sourcing, providing tools, resources, and support to help interested businesses adopt the model. In 2018, the Digital Jobs Africa (DJA) initiative will conclude as an active project, but while the Foundation will not be directly funding in the youth training space after 2018, it will in no way be stepping away from job creation. The next phase of jobs intervention will be the sharing and scaling of the knowledge garnered over the project period. They will be focused on packaging this knowledge in a consumable way, and scaling the impact and adoption of recommended practices to as many organisations as possible. There is a real value proposition in Impact Sourcing, and through the GISC we hope to grow this inclusive hiring practice globally. The Global Impact Sourcing Coalition (GISC), which was launched in September 2016 by The Foundation, is a forum of the world’s leading companies committed to incorporate and scale impact sourcing as a business strategy. The GISC is about integrating this inclusive employment practice into business models, companies have the opportunity to achieve business goals and targets, and at the same time highlight their commitment to the local communities in which they operate. We would like to see the expansion of the GISC. There is massive potential in South Africa for global investment into BPO/ contact centers. Despite the cost arbitrage clients benefit from, there are numerous additional value propositions to setting up offshore BPO centres in South Africa including the wide and deep available skills pool – which through the intentional engagement of demand driven trainers is constantly being fed. There is the robust world class infrastructure including telco as well as the quality delivery from the mature, deep domain availability the sector has on offer. Cultural affinity with many of the countries source markets as well as an abundance of English speaking skills. Partnership support from the Department of Trade and Industry (DTI) via their lucrative incentive scheme as well as the rand’s depreciation makes off-shore BPO jobs to South Africa very attractive, and with the evidence of the business case, global investment can drive new jobs in this sector. The Global Impact Sourcing Coalition has created a globally aligned standard and metrics with which to both approach and measure impact sourcing initiatives. This will help global buyers scale up their commitment and employ a consistent approach across markets, while empowering service providers to communicate their impact sourcing capabilities and impact through a common methodology that meets their clients’ needs. Members on the GISC represent just over 7% of the total global BPO population of around 15 Million and brags buyer members such as Microsoft, Tata, Bloomberg and providers such as merchants. Aegis and Convergys to name a few. The soon to be launched Demand Driven Training toolkit is a framework which youth engagement institutions such as youth social impact organisations – who assist in training and linking to the world of work and institutions of higher learning for example TVet Colleges can adopt and implement to better align their supply of skills to the required demand for skills. 5. The official stats in South Africa state that unemployment rates are rising. The logical conclusion is that there are not enough jobs available. What is the reality behind this assumption? The statement that there are not enough jobs available is not accurate. The reality is that there are jobs, but the matching mechanism between the job seeker and the employer has not evolved to cater for the social and economic realities of today’s communities. Corporates have cut themselves off from the communities where the skills they seek reside. It is clear that the way we are used to doing recruiting is not logical or fair and is clearly not working. The majority of local community members who have both the skill and expertise required do not have access to the organisations offering the job opportunities. One solution is for corporates to expand their boundaries and open themselves up for easier access to these work seekers. Classic digital or electronic recruiting excludes many skills from available opportunities, simply due to lack of digital access. Companies like Lulaway understand this and by creating innovative solutions to expand access to jobs to all communities play an important part of addressing this mismatch and bridging the gap. 6. Are you optimistic about South African youth? There is so much negative rhetoric about South African youth. The stereotype is a young person who is unemployed, feels entitled, is lazy and unwilling to work. I have experienced otherwise. I have encountered a generation of young people who are dynamic, hungry and prepared to work hard. They are ambitious and have aspirations. They are questioning and embrace the concept of ‘ubuntu’ more than previous generations – absolute gems waiting to be discovered. They often live in overwhelming poverty and struggle without their basic needs being met. 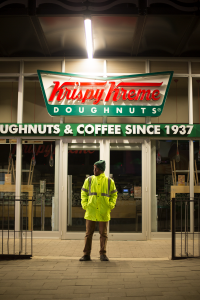 For them just to get to work requires immense planning, sacrifice and dedication. They do not want to be pitied or labelled ‘disadvantaged’. What they are looking for are openings with prospects for growth and learning. They are desperately seeking access to opportunities where they can have agency and show their worth and value. There is so much social capital which the middle class take for granted; such as ‘dining-room-table’ discussions where values such as grit & responsibility are implicitly passed on are for the most part absent in a large percentage of youth’s homes. It is these ‘ready-to-work’ skills which employers are looking for and assume our skills base already have embedded from their upbringing. This is an incorrect assumption and it is through many of the phenomenal demand -driven training youth engagement firms such as Lulaway that these skills are being trained and shared. Our youth need our support and collaboration to help them be absorbed into the workforce. Interventions which address these shortfalls and foster these skills will go a long way in empowering this promising generation to succeed. 7. What new practices – on an individual and societal level – do we need to foster in order for a fair world to exist? I wish there was a simple one step process to achieve a ‘fair-world’. I believe that as a start for things to shift, we have to embody the changes that we want to see. We cannot say we want & hope for change without being willing to change ourselves both individually as well as collectively. The world is becoming progressively fragmented. Numerous forms of bias and discrimination are growing globally and are becoming more visible and angry. The refugee crisis in Europe is frightening for all involved and there are no immediate solutions on the horizon. Globally we need to embrace diversity, and this can only take place through dialogue. The ‘fear of the other’ is an overwhelmingly powerful destructive force. Fear can be a much stronger force than hope & love but open and willing dialogue will pave the way to close many of the chasms that exist and overcome this fear. 8. How have you been personally impacted by your involvement in this sphere? This has, and continues to be, been a very meaningful personal journey which has transformed my thinking and outlook. The purpose and meaning on a daily basis I have is very profound, I am now more than ever extremely grateful for what we often take for granted and give thanks daily. While it’s heart-breaking to experience the reality facing the majority of our fellow South Africans, I have learned that I can only do so much, and that one can either be part of the problem or the solution. I am grateful to have the opportunity to work alongside many amazing individuals and organisations who are each playing a small part in the solution. I am exceptionally thankful for selfless and passionate individuals and organisations like Lulaway who refuse to look away, but rather face the issues head-on and are willing to test and try the unconventional to test for new possible solutions. Melusi was placed in April 2017 by Lulaway at the Krispy Kreme factory in Limbro Park, Johannesburg. 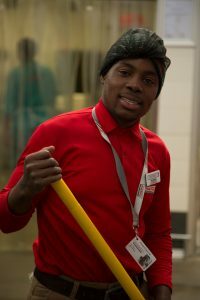 He is thrilled that he can now afford to rent his own accommodation near his work, and gain experience and skills which he will be able to take with him on his journey. Melusi is driven by a deep wish to create a better future for his family and knows the importance of starting at the bottom. “I grew up in KZN and was raised by a single mother. It was very hard to see all my peers with their father, and my father wasn’t around. I have a Diploma in IT but I love food and cooking. 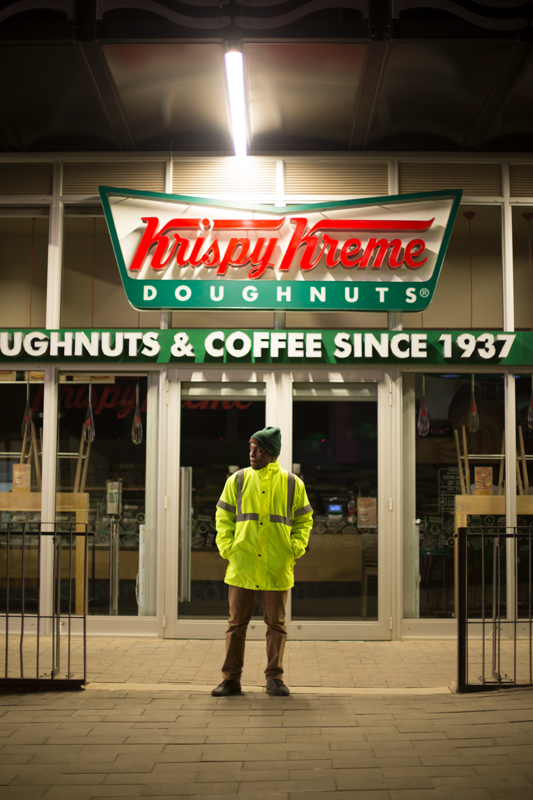 I work in the Krispy Kreme factory cleaning helping out with production. I see so many opportunities, and am here to learn. I would love one day to be a manager of a store. It was hard to grow up without my father, and when I have children in the future I want to be a good father to them”. Melusi has a lot going for him – long-term goals, willingness and a good work ethic. With the support of LulaLAB when the going gets tough, this internship will hopefully be the first step towards a successful and fulfilling career. 500 graduates will begin a year-long funded learnership on July 1, 2017 at Boston City Campus (Boston), a leading tertiary college and business school. These learners will work in the Boston call center and receive experiential training in functions such as debt collection, lead generation and sales. The learners will receive a recognized qualification upon completion and will receive invaluable practical work experience. This project is the result of a three-way synergy between the W&R Seta, Boston and Lulaway. 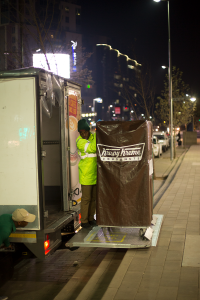 Lulaway was responsible for securing the funding from the W & R Seta on behalf of Boston. Lulaway is also responsible for sourcing the candidates and all the administrative and payroll aspects of the program.